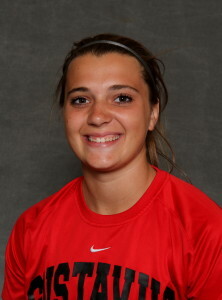 Ashley Becker made seven saves in the shutout win over Macalester. ST. PAUL, Minn. – The Gustavus women’s soccer team ended a three-game skid Tuesday night, defeating Macalester 2-0 to begin conference play. The win marks the first time since 1995 the Gusties beat Macalester, ending a stretch that included 17 losses and one tie. Maddison Ackiss (Jr., Fairbanks, Alaska) scored both of the Gustie goals Tuesday, while keeper Ashley Becker (Fy., Farmington, Minn.) recorded her first collegiate win in shutout fashion. The first goal of the night came in the 20th minute as Brittany Chase (Sr., Victoria, Minn.) found Ackiss from the right side for an open look at the net. Macalester outshot Gustavus 6-5 in the first half, but the Gusties carried a 1-0 lead into halftime. In the 69th minute, Ackiss found the back of the net for her second score of the night – this time on a long pass from the left by Coursey Edwards (Jr., Eden Prairie, Minn.). The shot was from 15 yards out. The Scots rattled off nine more shots in the second half, but none of them made it through as Becker tallied seven saves for the Black and Gold. The Gusties finished the night with 11 shots compared to 15 by the Scots. Gustavus improves to 1-3-1 overall and 1-0-0 in the Minnesota Intercollegiate Athletic Conference. The Gusties host St. Olaf at 3:30 p.m. on Sept. 19. Great start to the MIAC season! Very proud of your team play. Go Gusties! I’ll see you all on Wednesday.